Art for the Nation: Gifts in Honor of the 50th Anniversary of the national Gallery of Art, National Gallery of Art, Washington, D.C., 1991, 172-173, color repro. Winslow Homer, National Gallery of Art, Washington; Museum of Fine Arts, Boston; The Metropolitan Museum of Art, New York, 1995-1996, 154-155, no. 85. Winslow Homer and the Critics: Forging a National Art in the 1870s, The Nelson-Atkins Museum of Art, Kansas City; Los Angeles County Museum of Art; High Museum of Art, Atlanta, 2001-2002, unnumbered catalogue, fig. 83 (shown only in Kansas City). Winslow Homer in the National Gallery of Art, National Gallery of Art, Washington, D.C., 2005-2006, unnumbered brochure, detail on cover. Gingold, Diane J., and Elizabeth A.C. Weil. The Corporate Patron. New York, 1991: 108, color repro. Kopper, Philip. America's National Gallery of Art: A Gift to the Nation. New York, 1991: 325, color repro. Hechinger, Fred M. "About Partnership." On Common Ground (newsletter of the Yale-New Haven Teachers Institute) (Fall 1993): 20. Scholastic Art 24, (April-May 1994): 10. Winslow Homer. Exh. cat. National Gallery of Art, Washington; Museum of Fine Arts, Boston; The Metropolitan Museum of Art, New York, 1995-1996: no. 85. Unger, Miles. The Watercolors of Winslow Homer. New York, 2001: 65, 68. Winslow Homer and the Critics. Exh. cat. Nelson-Atkins Museum of Art, Kansas City, MO; Los Angeles County Museum of Art, Los Angeles; High Museum of Art, Atlanta, 2001-2002: fig. 83. Kelly, Franklin. "Winslow Homer in the National Gallery of Art." National Gallery of Art Bulletin, no. 33 (Summer 2005): 28, repro. Tedeschi, Martha with Kristi Dahm. 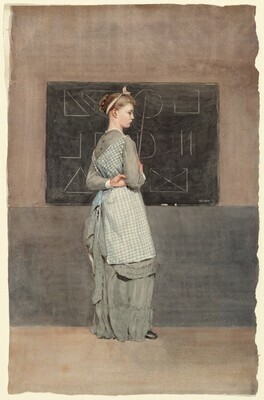 Watercolors by Winslow Homer: The Color of Light, Art Institute of Chicago, 2008: 57, fig. 24. National Gallery of Art. Highlights from the National Gallery of Art, Washington. Washington, 2016: 233, repro. American Watercolor in the Age of Homer and Sargent. Exh. cat. Philadelphia Museum of Art, 2017: 142, no. 108.